Recombinant N-terminal His tagged biotinylated-ubiquitin was produced in E. coli, purified using FPLC and formulated in a storage buffer containing 20 mM Tris pH 7.65, 150 mM NaCl, 1 mM DTT, 10% glycerol. Protein concentration was determined by spectrometry. >98% purity by SDS-PAGE. 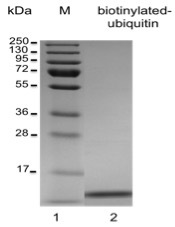 SDS-PAGE gel of recombinant biotinylated-ubiquitin (Lane 2). Lane 1, protein molecular weight marker.